Ours is not to wonder why; ours is but to do and dry. If it’s engineered to keep liquids in, it will do an excellent job of keeping them out, as well. That’s why Plastatech® IG (Industrial Grade) and Plastatech Tech 5® geomembranes are popular for basement wall and foundation waterproofing — in commercial and industrial applications. It provides a highly effective barrier to water intrusion in any climate. 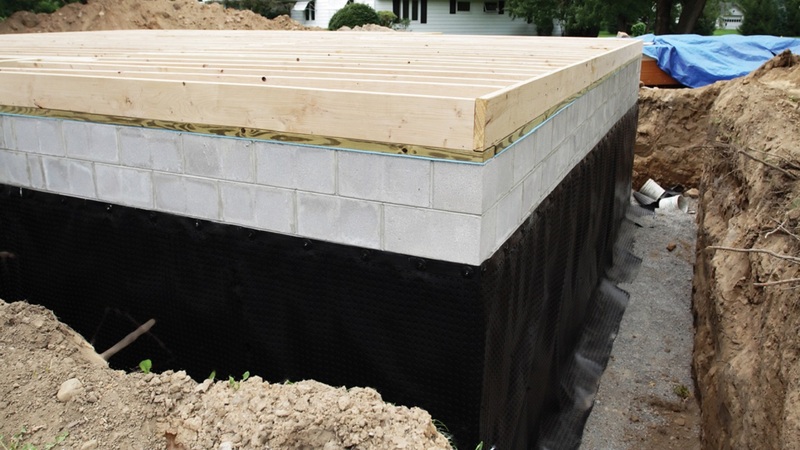 The membrane is typically attached with a termination bar and adhered to the concrete or block foundation wall. It usually drains into free-draining gravel fill and perforated drain tile, but it can work in conjunction with nearly any drainage and waterproofing system. Plastatech geomembranes are also used to waterproof foundations of specialized structures. For example, a water barrier outside a concrete secondary containment basin can help prolong the life of the concrete, protecting it from the effects of water intrusion and freeze-thaw cycles. Our non-porous geomembranes will not harbor mold or other microbes and is resistant to biodegradation. Their flexibility and puncture-and-tear resistance allows them to be installed against concrete, block and even old brick foundations — while avoiding punctures and tears during backfill. Their UV resistance and flexibility in high and low temperatures allows them to provide years of use.